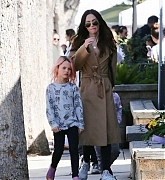 I have uploaded new photos of Megan Fox filming & on the set of “This Is Forty“. hm she’s holding her belly in some pics? im not saying she in ANY way LOOKS pregnant, her body is flawless.